This was interesting, since the first doc students I met were notable and inspiring because they loved their work so much. They definitely had a lot of late nights and anxiety about comps, or the job market, but at the end of the day, they loved their work and got a lot done. Of course, that’s easier said than done. 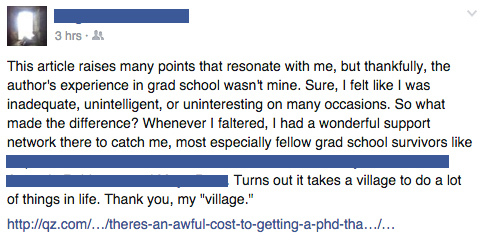 Many of us moved thousands of miles (even over oceans) to come to graduate school, and maintaining old friendships is hard when they are far away. Many graduate students report feeling less engaged with their old friends after starting a new routine and lifestyle with different concerns. Many people tend to pull away from their social support network when work gets tough. Breaking in to new friend groups is challenging, especially with limited time and money, and it will still be a while before you may feel comfortable being yourself around new people. I think the only thing to do is acknowledge that making new friends is scary and difficult, and that it will take a long time, and commit to doing it anyway. We have a weekly cohort social event, even though there are so few of us, and some of my lab mates have been really welcoming. I’ve started attending a church I can walk to, and I’m planning to start and host a meetup group when I get up the nerve (and money It’s going to be hard, but it’s too important to give up on. 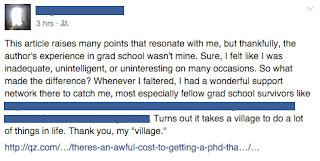 A friend of mine (now a PhD) suggested to me that perhaps it would be best if all graduate students checked in with a therapist occasionally, and especially at the outset. I did exactly that, and I now feel much less alone, and much less afraid of failure. Find some Emotional hygiene habits and techniques that work for you– prayer, meditation, exercise, art– and defend your self-investment time consistently. This resilience you’ll build won’t just help you fearlessly befriend new people, but also bounce back from setbacks and failures in your research, finish big projects, and weather the job market.